Lamar University’s Student Government Association dedicated a bench in memory of Lamar University’s former First Lady Nancy Evans. 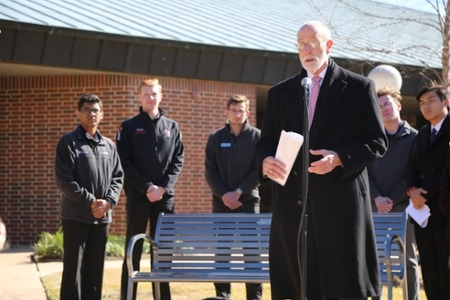 Students, faculty and administrators gathered at the John Gray Pond for the unveiling of the memorial bench, which was installed adjacent to the John Gray Center, one of Evans’ favorite spaces on the Lamar University campus. It is the first of several projects planned to beautify this specific area that Evans frequented. Student Government Association President Madison Marino said the bench honored Evans’ legacy of campus beautification. “It was not uncommon to see Ms. Evans working tirelessly to beautify the garden by the Mary and John Gray Library,” said Marino. “She would also be spotted all around campus tending to flower beds, pulling weeds, and helping to make improvements to the landscaping so that students could enjoy a beautiful campus and be proud of their school. The campus was truly her canvas. In the near future a fountain by Rockport sculptor Jesus Moroles, an artist that the Evans met, will be installed across from the bench. Rob Clark and Jerry Thacker are donating the fountain in Mrs. Evans’ memory. Lamar University President Ken Evans thanked the students and those in attendance and said he looked forward to sitting on the bench. “I will sit on the bench and remember all of the things that Nancy and I did together,” said Evans.